KELOWNA, BC, April 15, 2019 /CNW/ - FISSION URANIUM CORP. ("Fission" or "the Company") is pleased to announce the results of a Prefeasibility Study (the "PFS"), conducted by Roscoe Postle Associates Inc. ("RPA") and first-time estimate of Mineral Reserves for its' Patterson Lake South ("PLS") property in Canada's Athabasca Basin region. With an estimated OPEX of just US$6.77/lb U3O8 and an IRR (pre-tax) of 29%, the PFS further enhances the potential for highly-economic production at PLS. In addition, with the R780E zone still open at depth and along plunge to the east and the recently discovered high-grade mineralized zones along strike to the west and east (R1515W, R840W and R1620E zones) yet to be included in the reserve mine plan, there is clear upside for expanding the resource base and mine life and further improving the economics. The PFS is based on an open pit / underground hybrid operation and the Company is also progressing a PEA-level underground-only alternate scenario that indicates potential for improved economics. Robust Economics including Very Low Operating Costs "OPEX"
Indicated Resources contain 103,768,000 lbs U3O8, an increase of 18% compared to the previous Mineral Resource estimate, reported February 20, 2018. Additional Zones: The PFS Mineral Reserves are based on the Indicated Resources of the R780E and R00E zones. There are three other mineralized zones along strike that do not yet have sufficient drilling to classify the majority of their resources to Indicated, and future programs will work to advance this. These include the R1515W, R845W and R1620E zones. Zone Expansion: The R780E zone is open at depth and along plunge to the east and further opportunity exists to continue to grow the resource in those directions, potentially extending the underground mine life. Mineralization Upgrade: The PFS mine plan does not include areas of Inferred Resources in the R00E and R780E zones. Additional drilling has the potential to convert these to Indicated. The PFS base case for production at PLS is a hybrid operation (open pit and underground), aimed at maximizing extraction of R780E and R00E resources. However, it also has the potential to be mined as a purely underground operation. 3-year construction period and 7.3 year operation (based on the same Indicated Resources as the PFS base case). This PEA-level scenario is preliminary in nature and is based on assumptions and estimates that are not at a PFS level of detail and therefore cannot be categorized as Mineral Reserves. Mineral Resources that are not Mineral Reserves do not have demonstrated economic viability. There is no certainty that the PEA results will be realized. Ross McElroy, President, COO, and Chief Geologist for Fission, commented, "This prefeasibility study presents a very strong base case for production at PLS and further improves the potential economics and de-risks the project. Particular highlights include very low operating costs, a high internal rate of return and broad scope for growth and optimization. It also includes the important milestone of estimating mineral reserves at PLS. The focus of the report is production from the R00E and R780E zones. Moving forward, we have the potential to add resources to these two zones, and from the three other known mineralized zones, which may increase mine life and improve economics. Overall, we are very pleased with the results of the report and we are continuing to advance PLS towards feasibility status." The PFS has an effective date of April 9, 2019 and supersedes all previously-filed technical reports for PLS. The PFS was prepared by independent consultants led by RPA, who carried out resource and reserve estimation and mining work, assisted by BGC Engineering Inc. (geotechnical aspects), BAUER Foundations Canada Inc. (dyke and slurry cut-off wall), Wood Canada Ltd. (process and infrastructure), Clifton Associates Ltd. (environmental and tailings) and Arcadis Canada Inc. (radiological considerations). In addition to managing radiological issues common to high-grade uranium mining, a key technical challenge to developing the operation will be water control related to Patterson Lake and saturated sandy overburden. The PFS proposes a system of dykes and slurry cut-off walls – proven techniques successfully implemented at a number of Canadian mining operations, including the Diavik diamond mine and the Meadowbank gold mine. The development scenario does not require any new, untested, conceptual mining or construction methods. Since the PEA, extensive field programs have been carried out to confirm overburden characteristics, with these test results forming the basis of the PFS estimates. Mineral Resources were updated for the PFS by RPA using data collected up to and including 2018 diamond drilling campaigns. Estimated block model grades are based on chemical assays only. The Triple R deposit as defined in the Mineral Resource estimate is comprised of several nearly vertical stacked lenses across five mineralized zones that are generally oriented with an azimuth 66.2°. A set of cross-sections and level plans were interpreted to construct a total of 82 three-dimensional wireframe models (domains) for the mineralized zones at a minimum grade of 0.05% U3O8. Of the 82 wireframes, 16 are High Grade domains created at a minimum grade of approximately 5% U3O8, which are enveloped within the Low Grade domains. Block model grades were interpolated by inverse distance cubed (ID3). Classification into the Indicated and Inferred categories was guided by the drill hole spacing and the continuity of the mineralized zones. The updated resource estimate represents an 18% increase in pounds U3O8 classified as Indicated as compared to the previous Mineral Resource dated February 20, 2018. The increase in resource classified as Indicated is primarily due to infill drilling and conversion of Inferred Resources. Mineral Resources are reported inclusive of Mineral Reserves. Mineral Resources are reported within an open pit design at a cut-off grade of 0.15% U3O8 and 0.25% U3O8 for resources outside the pit that are potentially mined by underground methods. The cut-off grades are based on price of US$50 per lb U3O8 and an exchange rate of 0.75 C$/US$. A minimum mining width of 1.0 m was used. 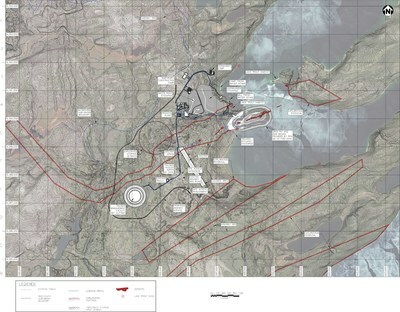 A first-time estimate of Mineral Reserves for the Project was carried out by RPA based on an open pit that captures all of the High Grade Indicated Resources in the R780E and R00E zones. Similar in concept to the 2015 PEA, the PFS Base Case design includes a sand dyke and plasticized cement slurry cut-off wall projecting into Patterson lake (Figure 1), and an onsite processing plant and associated infrastructure (Figure 2). Updates to the Mineral Resources and geotechnical understanding of the overburden and host rock are incorporated, based on field data collection programs and subsequent analysis. Outside of the open pit, underground Mineral Reserves are based on designs for transverse and longitudinal longhole stoping, accessed via a portal located within the open pit, and two ventilation raises also located within the pit. Mineral Reserves are summarized in Table 2. 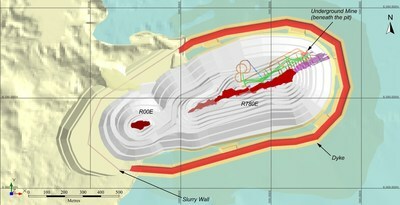 Underground Mineral Reserves are reported using stope shapes generated with a 0.25% U3O8 minimum grade. For underground mining, a minimum mining width of 3.0 m was used. 95% extraction factor on underground stopes. A four-year construction period, consisting of dyke building, slurry cut-off wall installation, dewatering, overburden removal, and plant and infrastructure construction. Six years of open pit operations at 1,000 tonnes per day (tpd) ore, 12,000 tpd moved. Followed by two years of underground operations at 1,000 tpd ore.
2.89 Mt processed over 8.2 years, grading 1.42% U3O8. Process recovery of 96.7%, based on updated metallurgical testwork. Production of 87.5 M lbs of U3O8, including an average of 14.35 Mlbs per year for the first five years. Uranium price of US$50/lb U3O8, based on long-term consensus forecasts. Payback period of two years (pre-tax). An alternative scenario involving sinking shafts on land and developing underground workings below Patterson Lake eliminates the need for the dyke and slurry cut-off wall construction prior to mining (Figure 3). Featuring a reduced footprint and environmental impact, this scenario results in some improved economic outcomes (such as reduced initial capital costs), despite the loss of some Indicated Mineral Resources to a crown pillar. A comparison to the PFS Base Case is presented in Table 3. Fission plans to advance the Underground Only Scenario to PFS level, for direct comparison to the Base Case, and decision-making going into FS. Uranium mineralization of the Triple R deposit at PLS occurs within the Patterson Lake Conductive Corridor and has been traced by core drilling over ~3.18 km of east-west strike length in five separated mineralized "zones" which collectively make up the Triple R deposit. From west to east, these zones are: R1515W, R840W, R00E, R780E and R1620E. Through successful exploration programs completed to date, Triple R has evolved into a large, near surface, basement hosted, structurally controlled high-grade uranium deposit. The discovery hole was announced on November 05, 2012 with drill hole PLS12-022, from what is now referred to as the R00E zone. The R1515W, R840W and R00E zones make up the western region of the Triple R deposit and are located on land, where overburden thickness is generally between 55 m to 100 m. R1515W is the western-most of the zones and is drill defined to ~90 m in strike-length, ~68 m across strike and ~220 m vertical and where mineralization remains open in several directions. R840W is located ~515 m to the east along strike of R1515W and has a drill defined strike length of ~430 m. R00E is located ~485 m to the east along strike of R840W and is drill defined to ~115 m in strike length. The R780E zone and R1620E zones make up the eastern region of the Triple R deposit. Both zones are located beneath Patterson Lake where water depth is generally less than six metres and overburden thickness is generally about 50 m. R780E is located ~225 m to the east of R00E and has a drill defined strike length of ~945 m. R1620E is located ~210 m along strike to the east of R780E, and is drill defined to ~185 m in strike length. Mineralization along the Patterson Lake Corridor trend remains prospective along strike in both the western and eastern directions. Basement rocks within the mineralized trend are identified primarily as mafic volcanic rocks with varying degrees of alteration. Mineralization is both located within and associated with mafic volcanic intrusives with varying degrees of silicification, metasomatic mineral assemblages and hydrothermal graphite. The graphitic sequences are associated with the PL-3B basement Electro-Magnetic (EM) conductor. This News Release describes an updated Mineral Resource estimate, a first-time Mineral Reserve estimate, and a PFS Life of Mine Plan and cash flow based upon geological, engineering, technical and cost inputs developed by RPA and other study participants. A National Instrument 43-101 Technical Report will be filed on SEDAR and made available on the Company's website within 45 days. The technical information in this news release has been prepared in accordance with the Canadian regulatory requirements set out in National Instrument 43-101 and reviewed and approved by Jason Cox, P.Eng. of RPA, an independent qualified person. On behalf of the company, the technical information in this news release has been prepared in accordance with the Canadian regulatory requirements set out in National Instrument 43-101 and reviewed on behalf of the company by Ross McElroy, P.Geol., President and COO for Fission Uranium Corp., a qualified person. Fission Uranium Corp. is a Canadian based resource company specializing in the strategic exploration and development of the Patterson Lake South uranium property - host to the class-leading Triple R uranium deposit - and is headquartered in Kelowna, British Columbia. Fission's common shares are listed on the TSX Exchange under the symbol "FCU" and trade on the OTCQX marketplace in the U.S. under the symbol "FCUUF." Certain information contained in this press release constitutes "forward-looking information", within the meaning of Canadian legislation. Generally, these forward-looking statements can be identified by the use of forward-looking terminology such as "plans", "expects" or "does not expect", "is expected", "budget", "scheduled", "estimates", "forecasts", "intends", "anticipates" or "does not anticipate", or "believes", or variations of such words and phrases or state that certain actions, events or results "may", "could", "would", "might" or "will be taken", "occur", "be achieved" or "has the potential to". Forward looking statements contained in this press release may include statements regarding the future operating or financial performance of Fission and Fission Uranium which involve known and unknown risks and uncertainties which may not prove to be accurate. Actual results and outcomes may differ materially from what is expressed or forecasted in these forward-looking statements. Such statements are qualified in their entirety by the inherent risks and uncertainties surrounding future expectations. Among those factors which could cause actual results to differ materially are the following: market conditions and other risk factors listed from time to time in our reports filed with Canadian securities regulators on SEDAR at www.sedar.com. The forward-looking statements included in this press release are made as of the date of this press release and the Company and Fission Uranium disclaim any intention or obligation to update or revise any forward-looking statements, whether as a result of new information, future events or otherwise, except as expressly required by applicable securities legislation.